What did North Korea launch? North Korea conducted a flight test of an intercontinental ballistic missile (ICBM) that it has designated the Hwasong-14. During the July 3 test, the Hwasong-14 traveled for around 40 minutes before landing in the Sea of Japan, inside Japan’s exclusive economic zone. The missile was launched on a highly lofted trajectory to an altitude of about 2,800 kilometers and traveled some 930 kilometers in distance. Had the same motor’s thrust been put to a range-maximizing flight path, the Hwasong-14 could have traveled as far as 7,000 kilometers, enough to reach Alaska and well in range of Guam. If fired in an eastward direction to take advantage of the rotation of the earth, the Hwasong-14 could potentially reach up to 8,000 kilometers, putting Hawaii at risk. The missile appears to employ at least two stages and operates on liquid fuel. How significant is this event? This launch represents North Korea’s first-ever test of a true ICBM. An ICBM is classified as a ballistic missile that can deliver a warhead to a range of 5,500 kilometers or more. The definition was set during the Cold War, as 5,500 kilometers is approximately the minimum distance between contiguous Russian and U.S. territories. For North Korea to cross the 5,500-kilometer threshold is partly a symbolic accomplishment, but to do so with a 7,000- to 8,000-kilometer-ranged missile is a major step forward. Pyongyang would still require a missile of over 8,000 kilometers to begin reaching the lower 48 states, and at least 10,000 kilometers to reach the U.S. East Coast. North Korean press statements claim the Hwasong-14 can “strike anywhere on earth.” This is untrue, but the Hwasong-14 is indeed the first North Korea-based missile able to reach mainland North America, if one excludes North Korea’s Unha rockets, which are ostensibly space-launch vehicles with limited military utility. The July 3 flight could have also included a test of a reentry vehicle, as the missile’s lofted trajectory would provide a steep and fast path back into the atmosphere approximating the reentry of a still longer-range ICBM. Equally significant is North Korea’s continued and rapid missile activity over the last few years, including launches of the Musudan and Hwasong-12 intermediate-range missiles and the mobile, solid-fueled KN-15 medium-range missile. These actions also bear considerable political significance for the Republic of Korea (ROK) and for U.S. alliance relations with both ROK and Japan. In recent weeks, ROK president Moon Jae-in suspended the deployment of additional Terminal High Altitude Area Defense (THAAD) missile defense launchers on the Korean peninsula, to the deployment of which China has repeatedly objected. In the face of North Korea’s new missile technologies, it seems more likely that Japan and ROK will pursue more, rather than fewer, military capabilities, including missile defenses, strike capability, and intelligence, surveillance, and reconnaissance (ISR). 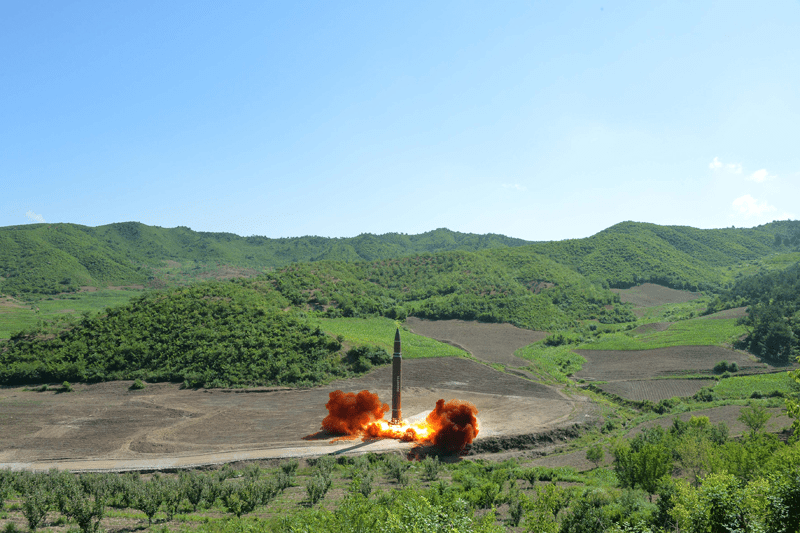 Both the Hwasong-12 and Hwasong-14 demonstrated new capabilities, but whether these will translate into near-term deployments remains unclear, at least for the time being. The configuration tested on July 3 represents a demonstration of rocket motors that could be used as part of a still-larger ICBM capable of ranging the continental United States. The Hwasong-14 appears to have been successful in itsinitial flight test, but this was preceded by several ground tests, as well as at least four tests of the Hwasong-12, which uses a similar engine. As such, the degree of confidence in the motors may be greater than this one flight test alone might suggest. We may expect to see more tests like this in the coming years to achieve increased range, capability, and reliability. Further development could include the addition of a third stage. In addition to threatening Alaska and Hawaii, North Korea’s new missiles could also provide it with improved regional strike capabilities. The additional heft could be used to deliver a heavier payload at shorter ranges and do so on a more lofted trajectory with a faster reentry velocity, which might be comparatively more challenging to defeat. Can the United States defend against an ICBM? 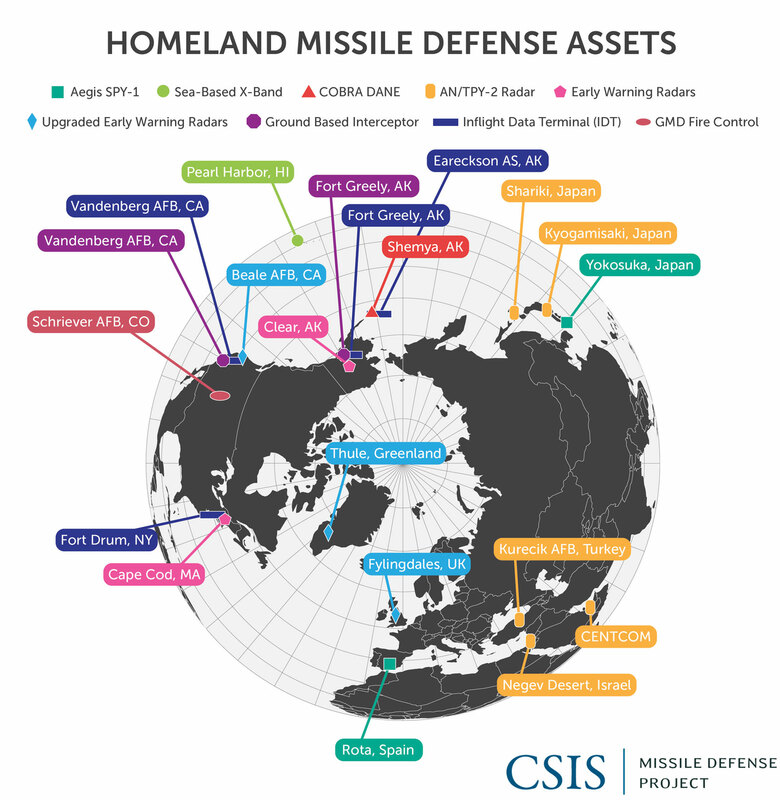 The United States operates the Ground-based Midcourse Defense (GMD) system designed to defeat long-range missile threats to the homeland, such as those from North Korea. GMD is the only U.S. missile defense system currently devoted to defending the U.S. homeland from long-range ballistic missile attacks. First operationally fielded in 2004, GMD and its associated elements today span 15 time zones, including two Ground-based Interceptor (GBI) sites at Ft. Greely, Alaska, and Vandenberg AFB, California; seven types of sensors; and various command and control systems. By the end of this year, a total of 44 GBIs will be deployed, with 40 at Ft. Greely and another 4 at Vandenberg. In the event of a crisis, these interceptors and the broader system would provide a measure of protection that helps preclude blackmail, assure allies, and support the overall U.S. deterrence and defense posture. Homeland missile defense is nonetheless in need of continued modernization of its interceptors, sensors, and ground systems. In a CSIS report published earlier this year, entitled Missile Defense 2020, we recommended the continuation or expansion of improvements to the system’s reliability, capability, and capacity. This includes continuing current interceptor modernization, such as the Redesigned Kill Vehicle and Multi-Object Kill Vehicle programs. Additional interceptors may also be in order in the near term, as may development of a space-based sensor layer to better track missiles in flight. Tom Karako and Ian Williams, "North Korea’s New ICBM," Missile Threat, Center for Strategic and International Studies, July 6, 2017, last modified November 29, 2018, https://missilethreat.csis.org/critical-questions-north-koreas-new-icbm/.